Pumpkin is part of the gourd-like squash family. They are thought to have originated in North America and are grown for culinary and cultural use (traditionally carved at Halloween). Although most commercial grown pumpkin in the U.S. and Hawaii is the orange Jack o Lantern variety, there is a diversity in the pumpkin world with size and color (red, green, white). They have a thick orange or yellow creased shell, their hollows are filled with white seeds. They grow on a vine on the ground in fields. In fall, many growers of pumpkins hold events before Halloween, allowing customers to choose their own pumpkins from the field, often called Pumpkin Patches. In North America, other winter squashes are sometimes referred to as squashes, such as Kabocha and Calabaza. As this resource guide is based in Hawaii, where Kabocha and Kalabasa are more common year round and are thought to be culinarily distinctive, we have given both their own categories. The bright orange color is an obvious indicator of its high beta-carotene content, vitamin A and C. It is also loaded with fiber. Pumpkin Seeds are a good source of iron, magnesium, and zinc. – Always wash and dry your pumpkin well before cutting. – The cooked flesh and the seeds of pumpkin can be eaten. 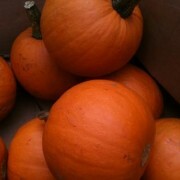 – To prepare pumpkin, carefully cut on even and stable surface. The shell can be difficult to cut and slippery so great care should be taken. The outer skin can be peeled off easily from smaller pieces with a vegetable peeler. – The seeds can be removed to be washed, dried, and roasted seperately. – Pumpkin flesh can be roasted, stewed, steamed, simmered, stir-fried, baked. Baked or steamed flesh can be pureed and used in dessert dishes such as pie, breads, muffins, or even smoothies. For cooking, smaller pumpkins are often more tender and flavorful. Select a pumpkin free of blemishes or bruises, stem still on, and with a duller finish (shiny indicates it may have been picked too soon). Store in cool dry place for up to a month. Leftover cooked pumpkin can be stored in freezer for up to 16 months.